An easy-to-read, common sense handbook for all horse owners, from greenhorns to old hands. 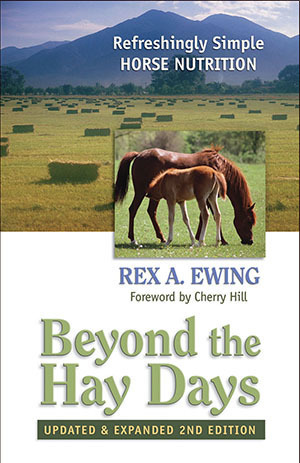 Beyond the Hay Days covers everything from simple hay-and-grain basics to vitamins, minerals and supplements, including the latest word on glucosamine, Omega fatty acids, bromelain and more. Learn how to meet the nutritional demands of horses at various ages and levels of activities, from pleasure horses to mares, foals and yearlings, to stallions and performance horses. Handy charts and tables put the information at your fingertips, and helpful formulas for calculating feed rations make this the one book on equine nutrition you’ll read and refer to again and again. Complete Study Guide with answers ($10) available. "If this is the only book you ever buy on equine nutrition, you won't go wrong." "Ewing doesn’t strike me as a man who’s in love with calculators and analytical chemistry. He’s a horse lover. He speaks our language and he’s a practical man. On matters of equine nutrition, he cuts to the chase....Ewing hands it to you on a silver platter and makes it downright palatable. I particularly liked the chapter on minerals, which, in my opinion, is the biggest black hole in the average horseman’s nutritional knowledge. Buy this book, and read it." "This gem of a paperback is a treasure trove of facts about what every horse-keeper needs to know about feeding horses. Years as CEO of an equine feed company gave him the fodder to write this handy little reference book, suitable for greenhorns and weathered trail hands alike - healthy doses of common sense interspersed with science make it very palatable and easy to digest." "Simple is the operative word. What could’ve been a scientific treatise is instead a user-friendly, easy-to-read equine nutrition guide. In addition to traditional rations, such as grain and hay, Ewing also discusses vitamins, mineral, nutraceuticals and supplements." Rex Ewing’s diverse interests have led him from Colorado to Costa Rica to Alaska, working cattle and horses, mining gold, and formulating equine supplements. He now lives at the end of a bad dirt road in the Colorado Rockies with his wife LaVonne and two dogs. There he writes novels and non-fiction books from his hand-hewn log cabin powered by the sun and wind.